When I decided to become a writer, it wasn’t so I could expose the most pressing myths facing today’s automotive enthusiasts. It was so I could wake up at 10 a.m. and lounge around all day without wearing pants. Today, I’ve decided to do both. No, I am instead referring to an even more widely held belief: the one that says the Tail of the Dragon is among the best driving roads in the world. You’ve probably heard this myth from various sources, namely the Tail of the Dragon Area Chamber of Commerce, which teams up each year with the local police force to ensure that everyone who visits the area gets a ticket, but only after they’ve placed a non-refundable deposit on lodging. Well, today, I’m going to debunk it, using my typical Myth Debunking Strategy. This involves a) looking up “debunk” in the dictionary to make sure I’ve used it correctly, and b) employing gross factual inaccuracies to convey my point. Let’s get started. First, a little background. Nestled in the marry-your-cousin hills of eastern Tennessee, TotD (as guys who drive modified GTIs call it) is a really curvy stretch of some US highway. I don’t remember the exact highway number, but a lot of motorcycle riders do, since they get it tattooed on their arms. For you Europeans out there, imagine Stelvio Pass, except all the road signs have bullet holes. Of course, I already know what you’re thinking. You’re thinking: Tons of curves in the middle of nowhere?! How can that be bad?! You might also be thinking: DeMuro you sunovabitch, I live right next to the Tail of the Dragon, and I can count as high as I want! Hell, just last month, me and my brother Cletus shot 219 different road signs! Presumably, you are thinking this while riding a lawnmower into town. 1. The curves. 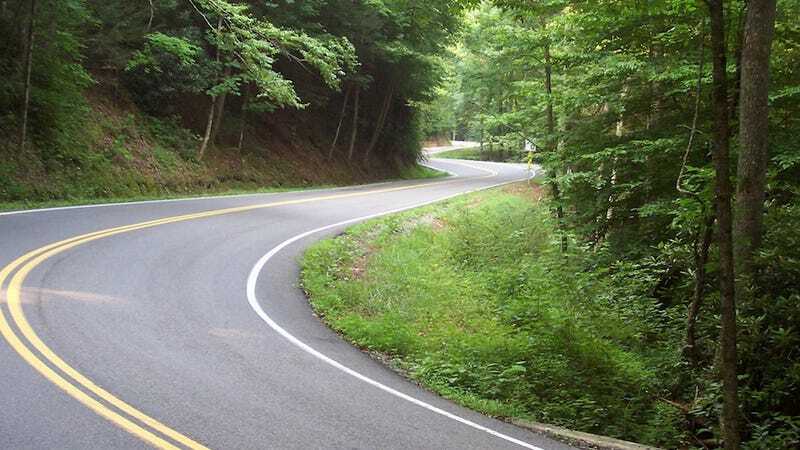 If you’ve never been to the Tail of the Dragon, you probably think it’s a fun, winding road where you can have a good time exploring the limits of your car. But really, it’s like trying to drive a pontoon boat through Venice. There are two main problems. One is the sheer number of curves. Think of it this way: 318 curves in 11 miles translates to an average of one curve every 60 yards. That means just as you’re coming out of one curve, you’re slamming on the brakes for the next one. You never get above 40 miles per hour. The other problem the type of curves. These aren’t sweeping bends. No, sirree. These are harsh, tight corners; the kind where you might say “Honey, we can’t take that road!” if you were, for example, bringing home a fish from PetSmart. 2. It’s crowded. I recently made the mistake of visiting the Tail of the Dragon on a weekend in the summer, which meant I encountered what I can only assume was every single car club that operates between Miami and Greater Toronto. As I recall, it was the Isetta Club that really ruined things for everyone. It’s not only cars. The sheer volume of motorcycles at the Tail of the Dragon is such that riders who frequent the area have taken to manufacturing a robotic arm that sticks out from their chest and gives that two-finger wave that motorcyclists are always giving to one another. If bikers didn’t have this, they would never have their left hand on the handlebars. 3. Police are everywhere. The last time I visited, I was given a ticket by a police officer who openly admitted he had “no idea” if I had committed the offense he described. Of course, I paid the ticket anyway, because going back up there would probably mean a) getting another ticket, or b) getting stuck behind the Isetta club. 4. There are better roads nearby. And now we come to the biggest problem with the Tail of the Dragon. While the Dragon is full of tight corners, and traffic, and police, many nearby roads have none of those problems. In fact, there are dozens of well-paved, little-traveled area roads with excellent sweeping corners and little traffic. And they’re largely free from police, who are busy clearing an accident where two motorcyclists lost their hands after colliding while attempting to give each other two-fingered waves. Seriously: it doesn’t matter if you visit the Devil’s Triangle, or the Cherohala Skyway, or some other road that sounds like a place Harry Potter might wake up with his lightning bolt scar throbbing. All of the area is a car lover’s paradise. And so I suggest: forget about the Tail of the Dragon, and instead enjoy everything that the North Carolina and Tennessee mountains have to offer. And don’t worry about getting lost. Just follow the signs with the bullet holes.